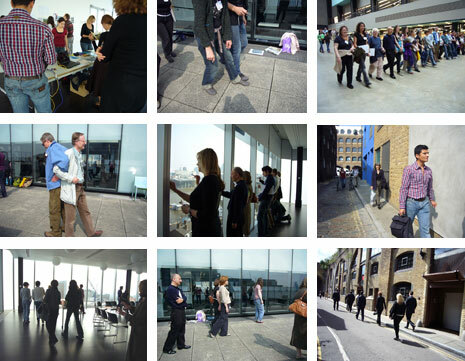 This weblog was started as a resource for the participants of “All great thoughts are conceived by walking” – an artist-led course commissioned by Tate Modern (14 and 28 April 2007). The idea for the blog was to create a space to share documentation of the course activities with a wider audience, and to allow participants to post information about their work. The original purpose was extended to include a range of resources: a bibliography, links, and lists of artists and artworks that propose walking as an intrinsic part of their work process and outcomes, with a diversity of approaches that I hope is refelected in the many contributions to this site. Many thanks to all the friends (old and new) who have given permission for their images and words to be reproduced in this site. If you have a walking work or project that you would like to add, please post it as a comment in the Contribute page. this is a great resource, thankyou.. I am starting to write an essay concerning walking and art, I use walking in the flaneurial sense as a catalyst for my work. Apart from the obvious artists, Long and Fulton I am at a bit of a loss for critical theory, although I have found ‘The Poetics of Space’ Gaston Bachhelard to be good, any suggestions would be great. You should check out Francis Alys, Belgian born artist living in Mexico City. He performs these walks that he calls Paseos. I am writing my thesis on artists that subvert the everyday (activities, routines, systems etc) like walking, eating, working etc. and one of the chapters will be about artists that use the walking as a medium. I am still researching but i will give you some names that have helped me so far. Its hard to find any critical theory on Long, i have been looking. Here is a link to another artist who uses walking as an artistic practice. on January 28, 2011 at 2:34 pm | Reply R.S. You are probably well aware of this text as the whole book is an exploration into subversion of the everyday but if not, Michel de Certeau’s ‘The Practice of Everyday Life’ has a chapter ‘Walking in the City’ which would probably be of interest to you. In this chapter he likens the process of walking to the using of language, where words and building are structures that shape our communication, but do not describe it completely, as each person has their own use and style.